Lan-Ro Equipments Inc. is based on the extensive experience acquired by its founding president, Mr. Langis Beaulieu, over a twenty year span on construction sites, among others, in Africa and the province of Quebec, in which he held the titles of Land Surveyor, Superintendent and Foreman. 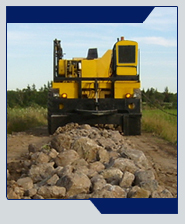 In 1997, Lan-Ro Equipments Inc. is founded along with the creation of a hammer fitted mobile crusher prototype capable of crushing rocks into aggregates from 0 to 2½ inches. It isn’t long thereafter that Lan-Ro Equipments obtains its first contracts with Quebec’s Ministry of Transportation and various Forestry Corporations like Domtar and Kruger. Although pleased with the results of its mobile crusher, Lan-Ro looks to obtain smaller and more specific particle-size distributions, like 0-3/4 of an inch, in order to comply with its clientele’s miscellaneous requirements. A few years later, Lan-Ro Equipments reaches this goal and successfully modifies its mobile crusher by developing and perfecting a revolutionary technology that allows, throughout the whole crushing process, a smaller particle-size distribution than other conventional mobile crushers. In May of 2001 and in keeping with its innovation tradition, Lan-Ro Equipments modifies yet another aspect of its mobile crusher to allow it to convert into a stationary mode, therefore giving it the flexibility to either crush rocks in a quarry or directly on a job site. Innovation has always been a driving force at Lan-Ro Equipments, and many other accessories have been created over the years with the intent to comply with the demands of its customers. The simplicity and versatility thought out for each of Lan-Ro’s equipment maximizes their operating efficiency. With Lan-Ro Equipments Inc., you get the same quality results as with a stationary crusher all the while saving time and money.